Wisconsin Sports Tap: Run the Risk? The Prize? A 27-year-old Cy Young winner. A right-hander who had one of the most dominant seasons in recent memory just a year ago. He's no rental either, signed through the 2012 season with $27 million remaining on his contract. His name is Zack Greinke and if you believe the rumors he is available. But oh the cost, the cost, the cost. A pitcher of this caliber must take a fortune, a wealth of prospects that any rational team would be woe to even consider... right? The cost would be astronomical wouldn't it? To be blunt - yes. But this year, it may be worth it. A good template for a Greinke deal might be when Dan Haren was traded to the Arizona Diamondbacks in 2007. Haren was going to be 27 the following season and was coming off two very good seasons, though not as good as Grenike's last two. The deal was a six-for-two, with the D'backs sending Brett Anderson, Chris Carter, Aaron Cunningham, Dana Eveland, Carlos Gonzalez and Greg Smith to the A's for Haren and pitcher Conner Robertson. Now, Robertson and Eveland were essentially a wash as neither contributed to their new teams so for our purposes we will drop them from this discussion. Anderson has flashed big time potential in his two seasons with Oakland and could be a top of the rotation pitcher. Carter has shown good pop in the minors, but hasn't stuck at the big league level yet, though that could change. Cunningham was eventually traded to the Padres for Kevin Kouzmanoff and hit .288 for San Diego in 53 games in 2010. Greg Smith has bounced around since the trade but has seen time with three different major league teams. And then there is Carlos Gonzalez, who finished third in the NL MVP voting with the Rockies last year. This is what was traded for a pitcher who isn't as good as Zack Greinke. Mat Gamel - 1B/3B/COF - Gamel is undoubtedly the Brewers top hitter after the Lawrie trade. He is ready to contribute at the Major League level, though he doesn't have a position just yet. That may not be a problem for the Royals who have major question marks almost across the board offensively. Jeremy Jeffress - SP/RP - Whether or not Jeffress is going to be a starter or reliever (the smart money is on reliever) one thing is for sure - if he stays off the pot he will be in the big leagues and soon. Jeffress opened eyes with a September call-up and very nice showing in the Arizona Fall League. With a 100-mph arm he'd be a tough one to keep out of a Greinke trade. Jake Odorizzi - SP - I can already hear the cries of anguish coming from Brewer fans everywhere if this were to happen. Odorizzi might be a couple years away yet but his upside is undeniable. He's one of the Brewers top prospects and - barring injury - should be a productive major league player. Caleb Gindl - OF - The book is still not written on what kind of player Gindl can be but he has shown flashes of good power. He's an outfielder, more likely in one of the corners than center, and is well-liked by the organization. Gindl will probably be sniffing the big leagues in the next season or two and would be a very nice complimentary piece in a deal like this. Daniel Meadows - RP - Yet another pitcher, though his upside is unclear. Meadows has been very good in two minor league seasons. In 2010 he had a 1.13 WHIP and an ERA of 2.86. He was a 49th round pick but has pitched well so far and as a lefty he will continue to get chances. Is that all? Is that enough? 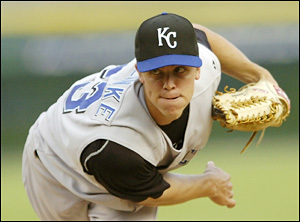 Mark my words, it will take big time prospects to wrestle Zack Greinke away from the Royals. But if you are the Royals it's also a deal you need to make soon before you find yourself in the same position the Brewers are in with Prince Fielder. While Milwaukee has a chance to contend next season Kansas City is a long way from that end. You'll notice there was no inclusion of Prince Fielder or Ryan Braun in this proposed trade. Fielder won't happen because a single season rental does no good for a perennially rebuilding team like the Royals. He makes them slightly better for one season and that would make no sense to any General Manager. Braun would make a good deal of sense, although I am not convinced that Milwaukee would trade him. He is the face of the franchise and is under an affordable contract through the 2015 season. Plus, trading away Braun would leave the Brewers offense in 2012 with an even more massive hole than it stands to face with losing just Fielder. So is this price too high? Do the Brewers just tuck their prospects away and maintain the status quo? It's hard to say, the last time Milwaukee traded for a game changing pitcher they made the playoffs and the fans and ownership responded. There is no doubt that a Greinke trade would make the Brewers a substantially better team for the next two seasons, but after that is impossible to say. Risk the future for a run at the present? They say Fortune favors the Bold. This sounds great...until Greinke complains of "a little stiffness" in his shoulder. MKE's farm is so thin now that a deal like he one suggested would leave them with almost nothing. That would be OK if this deal would set them up to contend for the next four years, but when it all hinges on the health of a single player...that's when I back away from the table. Certainly, Gbeinke is good and he is young. The deal you outline is probably about right. But if they can get a decent guy like Marcum for a one AA prospect (albeit their top prospect) then I think MKE is better off fishing in that stream rather than the big River Grienke. If they are giving up prospects I'd prefer to see them get Mike Minor from the Braves who will be at least a number 3 starter in this league if not be equally as good a pitcher as Grienke. Difference is we'd control him for 6 years and he'd be cheap for the first 3. A Minor deal would require much less in way of prospects, but also the return would be far less of a guarantee. No matter how good a pitcher is in the minor leagues all they are is untapped potential in the big leagues. Minor was a name floated around the trade deadline for Corey Hart by the way. That's very true, but Royals might force the issue. Either he stays with the woeful Royals for another year, or he at least gets a chance to compete for the postseason in MKE. Not to mention his value could go through the roof pitching in the NL. Regardless how you spin it, it's a long shot. This is a very nicely written post. Thankyou for sharing.